Readers will gain a better grasp of the whole story of Scripture and, most importantly, why these stories are the ones God chose to preserve for us through the writers of the Bible. 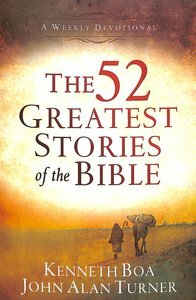 About "The 52 Greatest Stories of the Bible: A Devotional Study - Weekly Devotional"
John Turner is an application developer and systems administrator in Detroit, Michigan, supporting the advertising and marketing campaigns of Fortune 50 clients. With over two decades of computer experience, John has designed and administered high-availability and fault-tolerant systems for the automotive, health care, and advertising industries. He coauthored the "Apache Tomcat Security Handbook" and is an Apache Group committer. He holds a bachelor's degree in information systems. ý John's industry interests include vintage hardware, open source, mobile computing, and wireless networking.